Hi fat fashion fans! Sorry for my UBER absence these past couple of weeks- things have been absolutely bonkers in Fat Fashion land! Coming up here is my first post of many, and it’s the post detailing my birthday shennanigans- what I wore, what I received, what I drank and what I bought! Yes, two weeks ago I turned 23 years old, and promptly started using a night cream with anti-wrinkle properties, haha! It’s crazy how much two words- mid-twenties- can make a girl freak out. Okay, so 23 is hardly mid-twenties, but I feel decidedly older than when I was 22. I can also no longer sing along to Taylor Swift as honestly. No more wailing I’M FEELIN’ TWENNY TOOOO-OOO! and meaning it. I’m not exactly where I wanted to be by this birthday- my beautiful Collectif polka-dot dress is still in my wardrobe, longing to be worn, and I’m single as the day I was born- but I don’t feel so bad about it. Life is hectic and I’m dealing with every day as it comes. PLEASE NOTE- I am in no way bragging here! 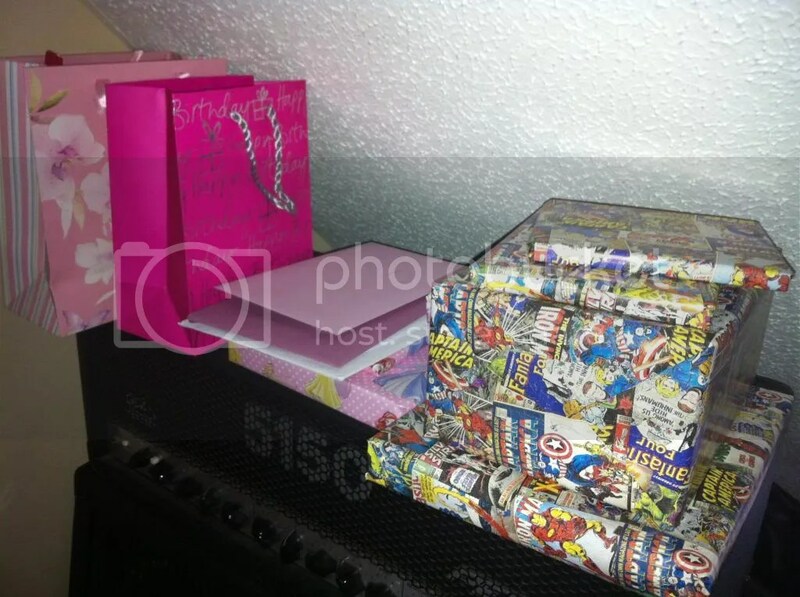 I just thought it’d be good to share a slice of my birthday life with you all, and I also LOVE to have a nosey in people’s lives and see the lovely things they received for their birthdays/in hauls. If you’re not a fan, then please feel free to give this post a miss! Anywho, I swallowed and quickly forced myself out the door before I made a nuisance of myself and opened things before I should have. 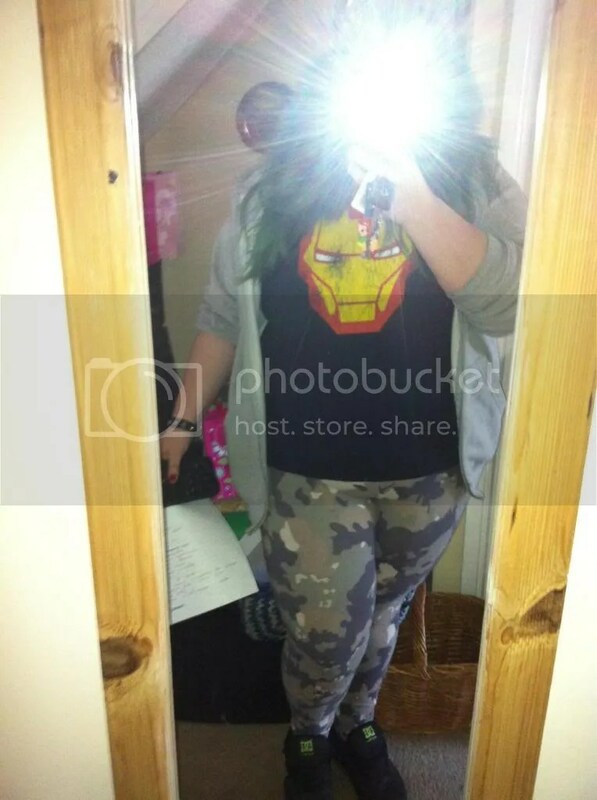 That day, I was rocking my Iron Man shirt and feeling pretty good about my fat self! 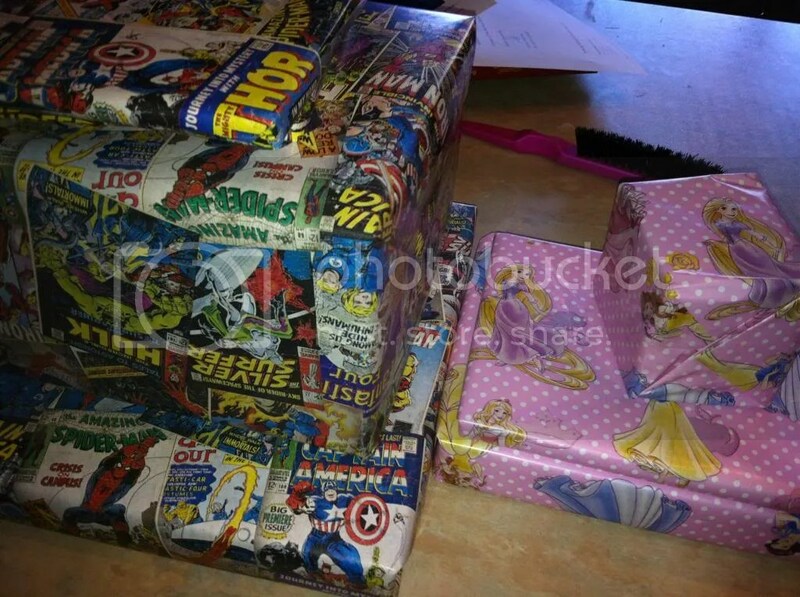 Mmm, Marvel-camo chic at it’s finest! I jumped into my car, and sped off into the town. 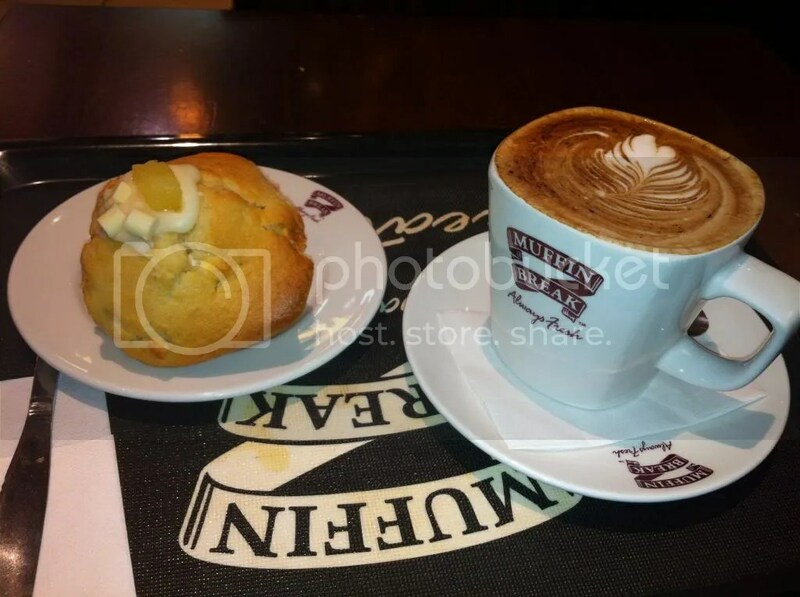 Once there, I promptly headed for Muffin Break and absolutely indulged with a white-chocolate and pineapple muffin, and a mocha. A MOCHA. Not a filter coffee with extra-skimmed milk, or a plain tea. A MOCHA. If a girl can’t treat herself on her birthday, when can she? How chic is that awesome Peacock-feather dealio on top of my coffee? I have to say, both things were as good as they look and this was the best way to start off my birthday. After relaxing in the coffee shop for a bit, working out my route for the shopping expedition, I set off. Nipping into Poundland was on my list for the day anyway, as you can get fairly decent cut-price First Aid stuff in there, like plasters and bandages, and whilst in there I decided to see if there was anything decent in the way of make-up that day. 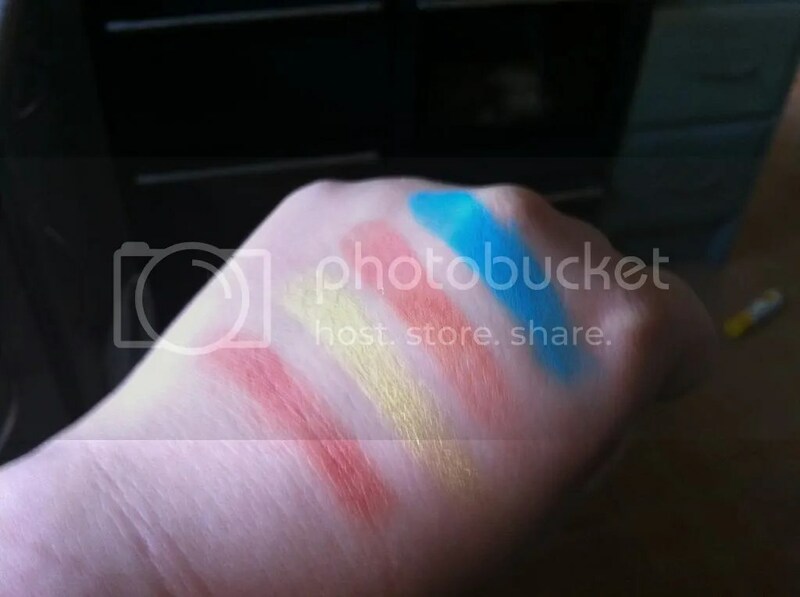 Would you believe it, I found three GORGEOUSLY pigmented Dainty Doll eyeshadows, and a pretty cool Wet ‘n’ Wild cheek/lips/eyes colour stick thing? How gorgeous are they!? They’re matte and they’re wonderful, soft and pigmented and just really impressive. The only snag is that they don’t have the colour name on the pot, just the number, so you have to open them up to check you have the right one. I can’t remember the names, apart from the blue one is Copacabana and the orange is something to do with a Tiger! The yellow may be Carnaby Street or something like that? Regardless, really awesome finds. I’m loving a weekly rummage in the Poundland make up selection at the moment. Anyway, after coming home and twiddling my thumbs a little- okay, I opened my cards, and I was absolutely floored at the generosity of my friends and family, they were all lovely cards and I got some really generous monetary gifts- it was finally time! 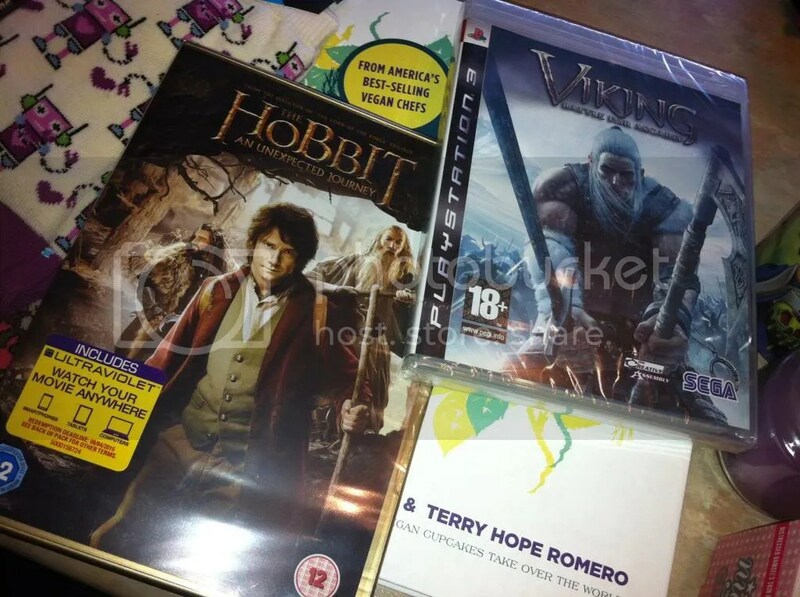 I was such a lucky girl this year, I got some really lovely presents from my family. They’re always so good at buying me things, even though I didn’t get some of what was on my list everything they got me was perfect and actually just what I wanted. I still have a great big grin on my face now- I love my family so much! Money’s pretty tight at the moment, we have holiday payments and university/college fees to pay for and everyone still managed to gift me something. I have the best family ever! How awesome are these socks! 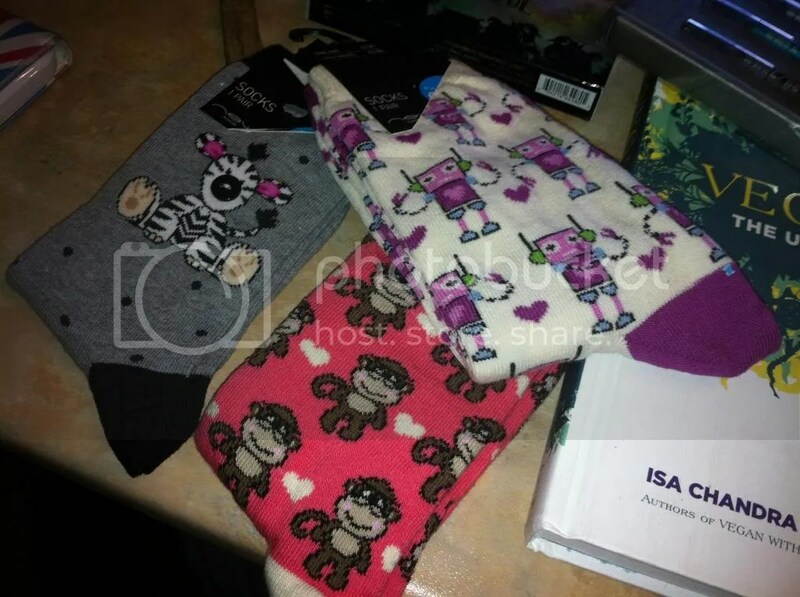 The zebra ones have a button for a nose, how cool is that? My favourite pair is the robots! Good ol’ New Look socks 🙂 AND I did ask for socks, by the way! You just have to get socks for Christmas and your birthday, don’t you? Make up wise, this is exactly what I asked for, and I am so thrilled! More Urban Decay joy in my life! 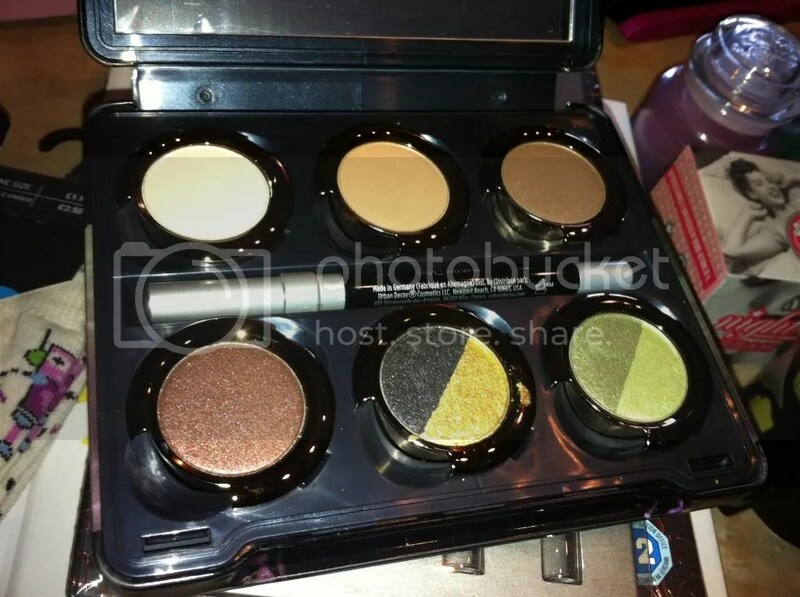 I finally have the Theodora palette to go with Glinda, yay! Also, the 24/7 double ended eyeliner set, which is full of beautiful, wearable colours. Swatches a bit later. This book is so big and beautiful and jam packed with yummy recipes. I’m not actually a vegan, but I’m toying with the idea of eventually going pure vegetarian as far as my diet goes and I love vegan cooking anyway. Isa Chandra Moskowitz and Terry Hope Romero are both awesome anyway! 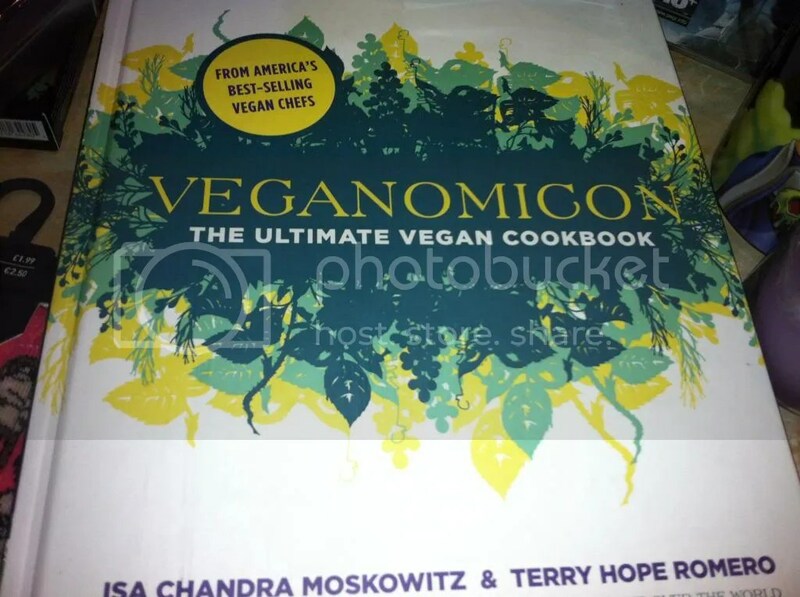 I have a few of ICM’s books anyway: Vegan Cupcakes Take Over The World is amazing. The Hobbit! YAY! Thanks, little bro! Can you imagine, though, I haven’t actually watched it since I got it though? I’ve been waiting for the right time… I’ve already played a bit of Viking, and if you can look past the absolute rubbish lore it’s a really good game. A little tricksy in parts, but that’s what makes a good game! 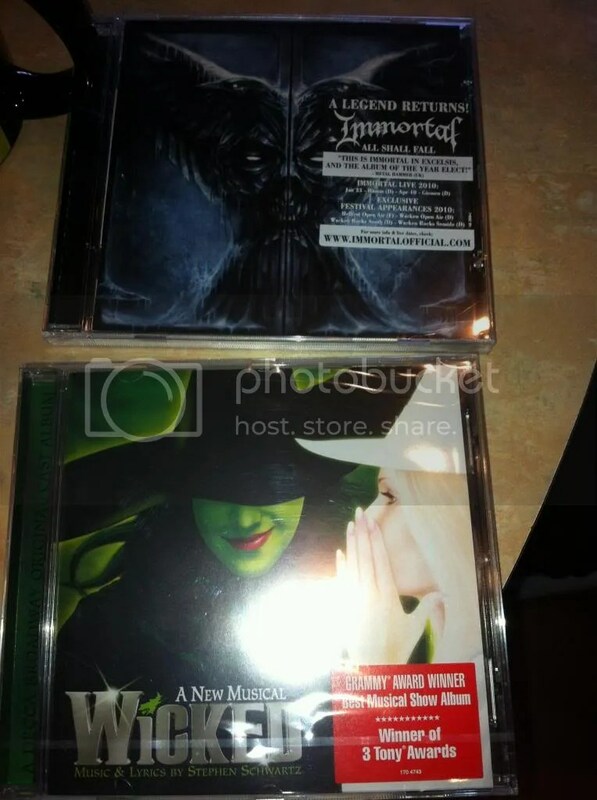 Two CDs straight from my list, and this also kinda sums up my personality- black metal right next to show tunes! Immortal’s latest offering is a brutal album, so I’m happy that I finally own it, and I lost my copy of the Wicked soundtrack a couple of years ago so yay for replacement! I love Wicked. Is that cliche? 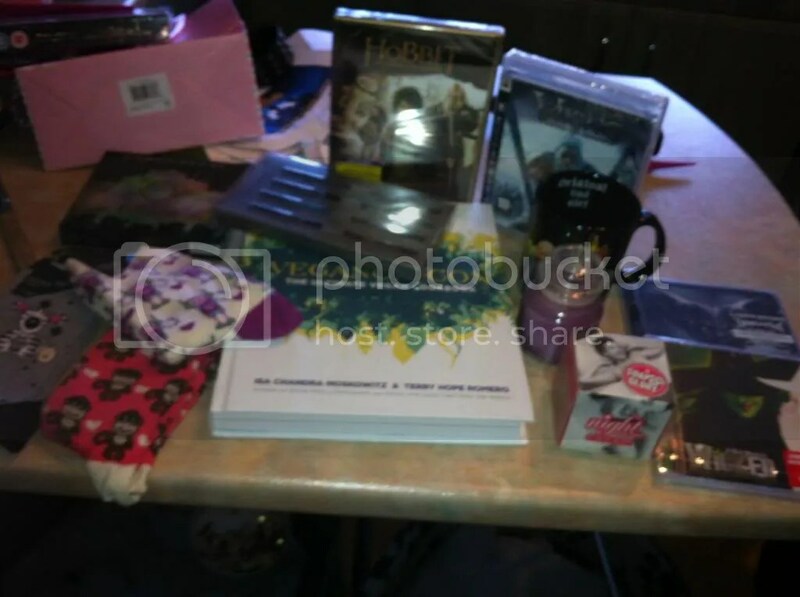 Bringing up the rear are the miscellaneous goodies! 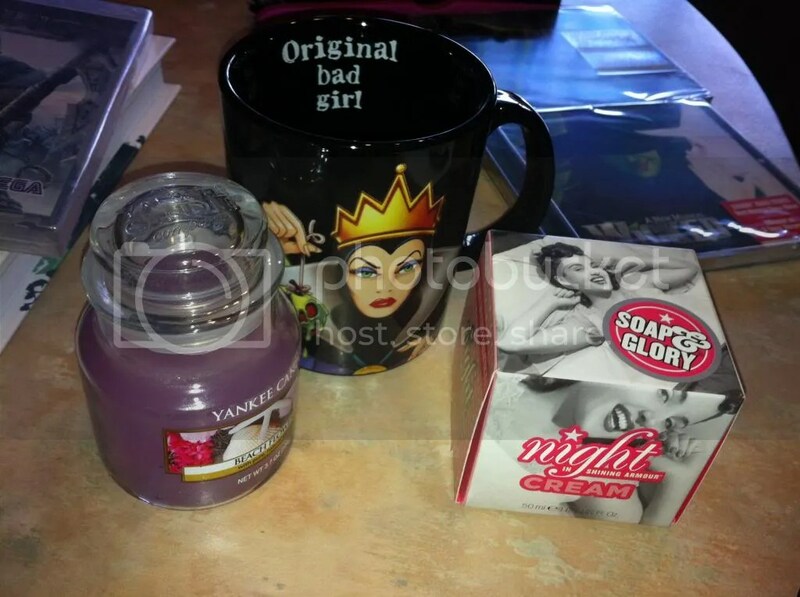 A Yankee Candle in Beach Flowers- it smells absolutely divine-, Soap and Glory’s Night in Shining Armour Cream, which is fantastic, smells good and sinks into my skin without being greasy and leaves it so soft in the morning, and an absolutely amazing Evil Queen mug. 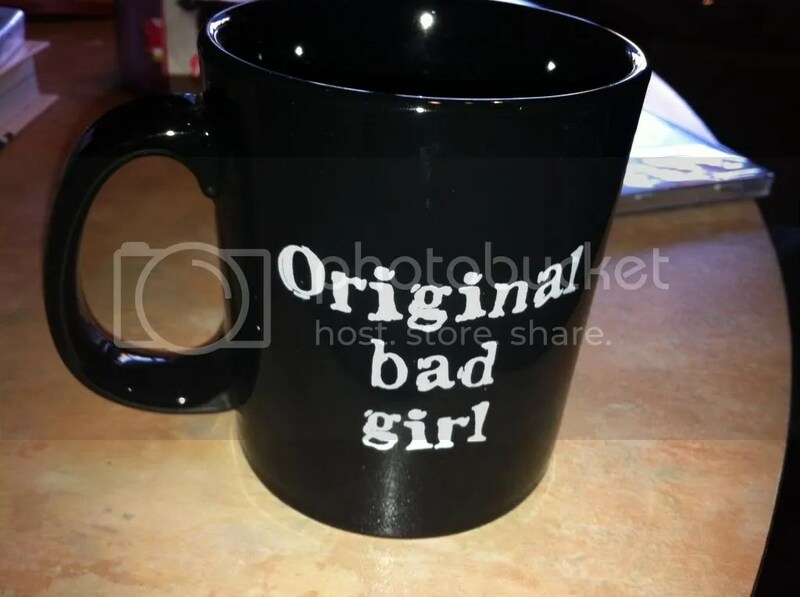 I’m starting to amass quite the collection of mugs, and this is a perfect addition. 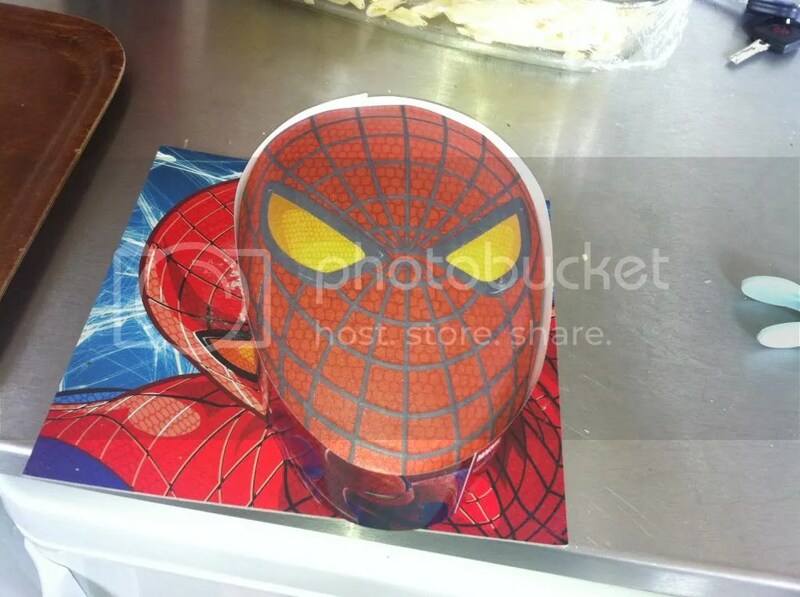 This is on the back as well as inside! Maleficent is actually my favourite Disney villainess, but I have a lot of love for the ‘Original Bad Girl’, as she really is. 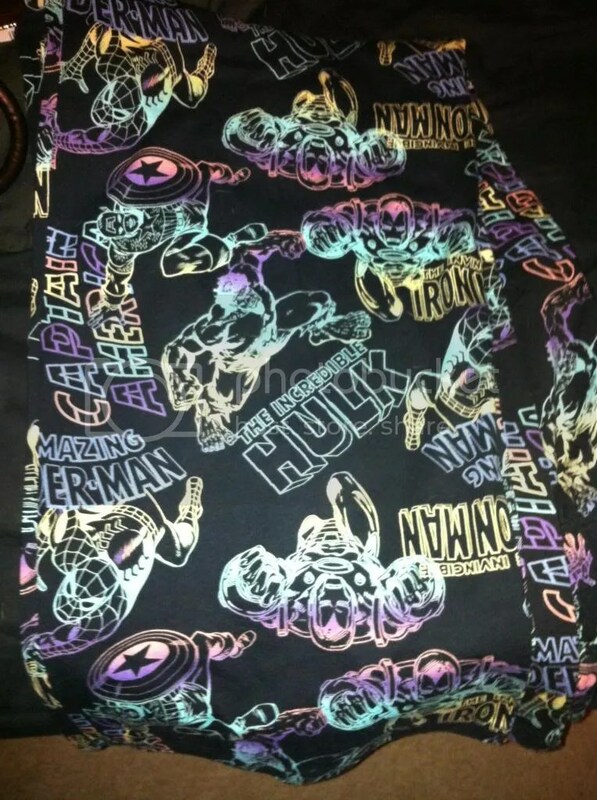 I also got these amazing PJs slightly later- I love novelty PJ bottoms, and my collection is mostly made up of men’s as they are the most comfortable and have the best designs! These are awesome. 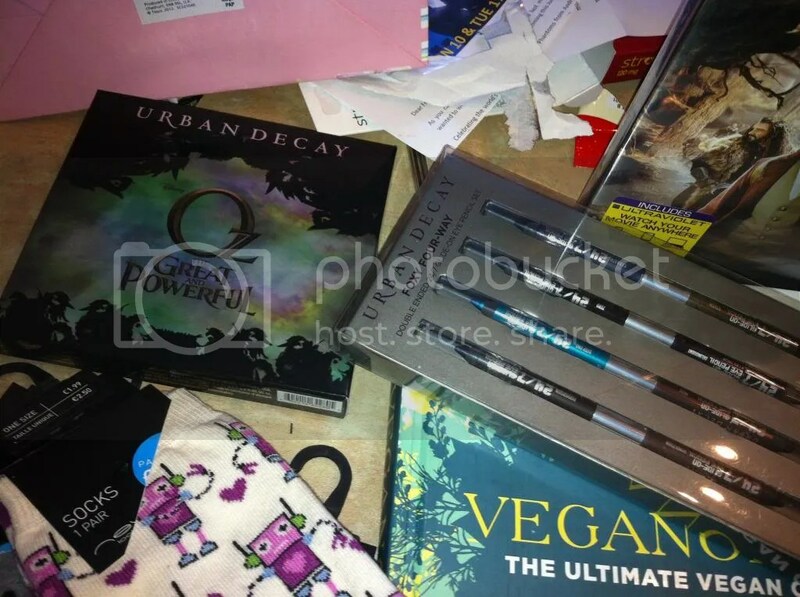 Then, it was time for me to go and get ready to go out with my parents and brother to celebrate, and whilst I was getting ready I swatched my new Urban Decay goodies. 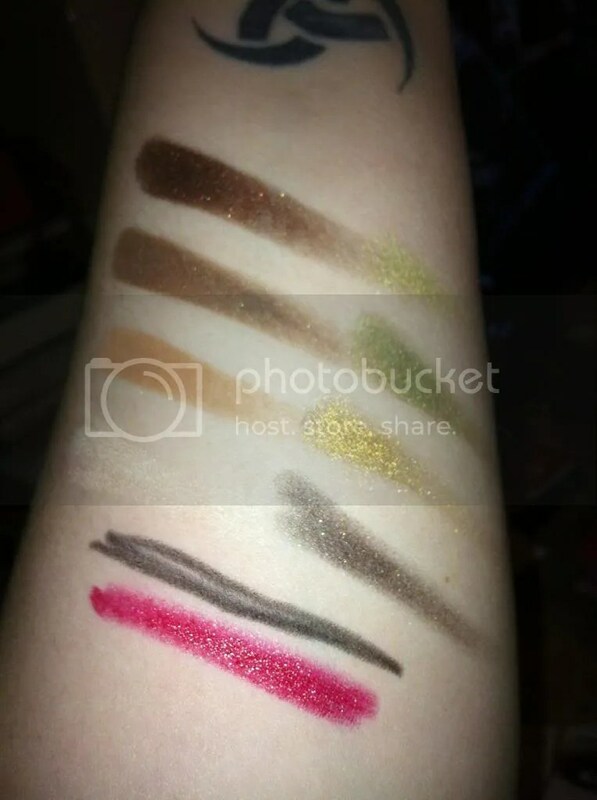 I won’t go into too much detail here, I’ll just show you the swatches and do a proper review later this week, but how gorgeous are all the shades? Much more earthy and neutral-leaning than Glinda, but I still can’t quite decide which is my favourite. Look at that pigmentation! Just look at it! ARAHRAHGAHGAHAHGGHHG so amazing!!! Apologies for the awful flash-glare! And this is what I wore in the evening. Primark shirt, Matalan pleather jacket, wet look leggings from an Estonian shop and my studded New Look wedge shoe-boots. Comfortable and- if I do say so myself- not bad looking! Apologies for the quality of the photograph! This was my face for the evening, and apart from my foundation I used everything from my stash. I just had to use MUA Undress Your Skin foundation because the Natural Collection Tinted Moisturiser was far, far too orange. 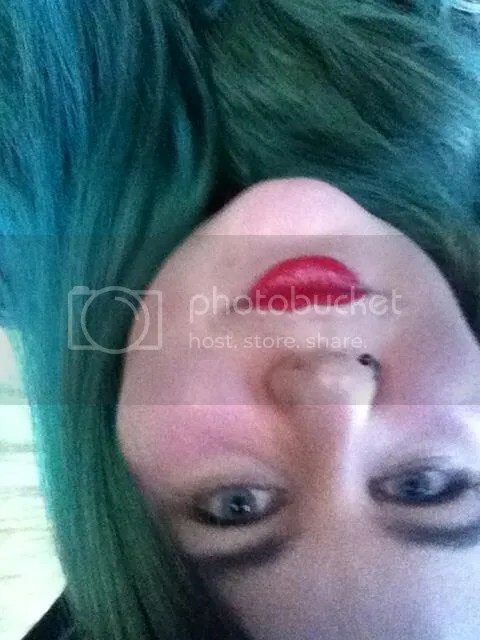 On my lips is the ELF Studio Matte Lip Colour in Rich Red, with MAC Cockney over the top. I like the effect and I’ll have to remember it! We went to Chimichanga’s in Amersham, a Mexican restaurant that we’d not tried before and because I am a sucker for Mexican food I decided my birthday would be a good day to test it out! It was a nice change from my default birthday choice of TGI Friday’s, especially as I would have ended up with some sort of Mexican dish there anyway! 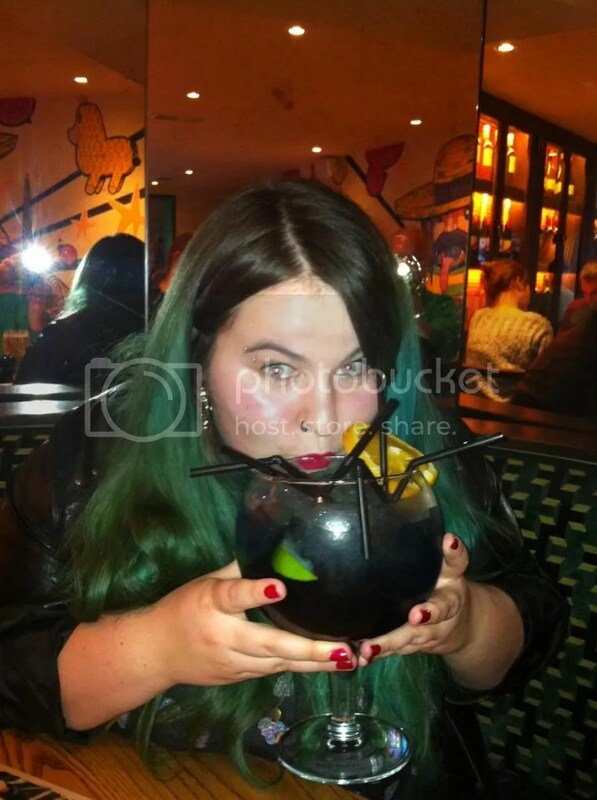 This is me with the amazing drink my mum and I shared, called the Chimichanga Fizz. It had everything in it, pretty much! It tasted divine, sort of like lemonade and Fanta, and definitely not alcoholic at all… which is good because it was lethal! For dinner, I had a prawn burrito which came with Mexican rice and black beans- it was actually presented beautifully and much cleaner than that but I smooshed in the salsa before I remembered to take a photograph. It was absolutely delicious, and the portion was just the right size. We had started with a vegetarian sharing platter and some nachos, and one of the amazing things was what they called ‘Mexican spring rolls’. Really tasty! We ended by sharing a cinnamon, toffee and banana ‘enchilada’ which came with dulce de leche- calories don’t count on your birthday, you know! 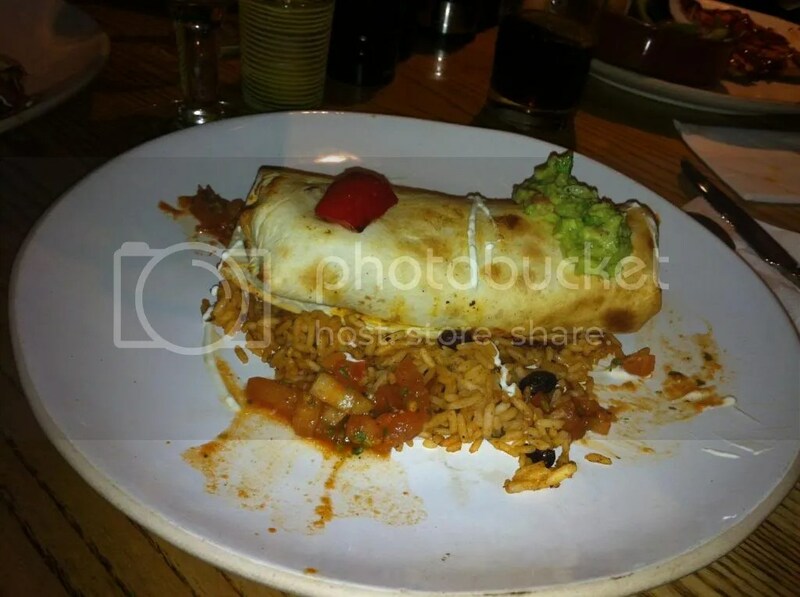 It was a brilliant evening, and if you have a Chimichanga’s near you I’d thoroughly recommend you try it out. It also wasn’t that bad price wise! At the weekend, during the Brownie camp, I even got a birthday cake! All in all, it was a brilliant birthday. I’m so lucky to have such generous parents and- when he wants to be- such a nice brother. I don’t even mind being a year older, really! 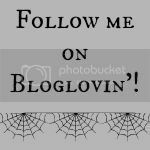 This entry was posted in Beauty, Hair, Makeup, Fashionista Musings and tagged 24/7 liners, beauty, birthday, haul, Theodora, Urban Decay. Bookmark the permalink. These goodies gave me liiife *. * So many pretty things!